Helena Puumala’s SF Romance series features a planet, Kordea, with seven moons. This rather unusual setting gives me the opportunity to talk about some of the remarkable moons in our solar system, as I test different moons for the cover of book 2 of the series (link given below). 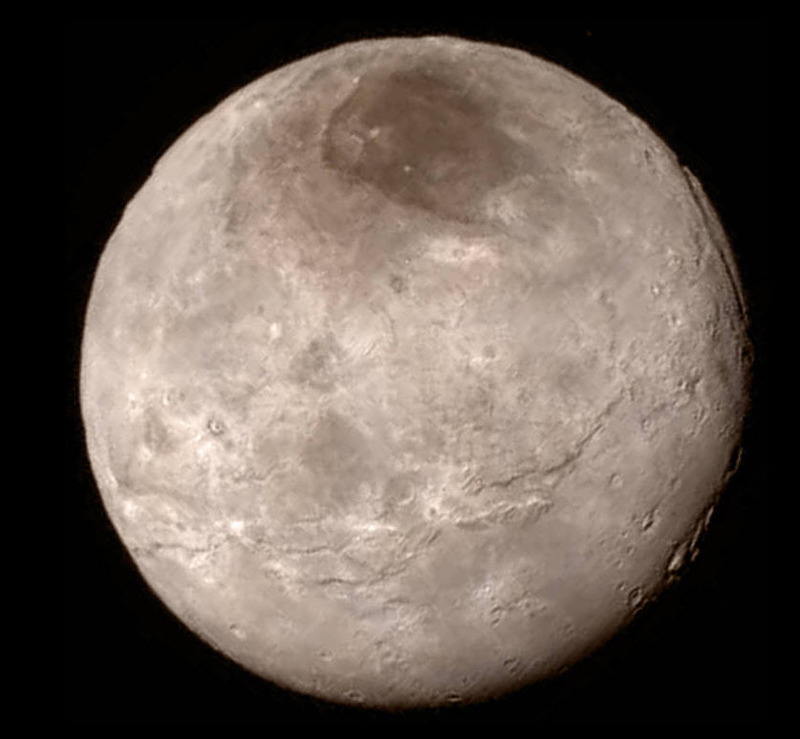 This blog is about the larger moon of Pluto, Charon, which has recently been visited by a spacecraft for the first time. It is by far the largest of Pluto’s five moons. In fact, it is sufficiently large compared to Pluto, that the two bodies orbit a common center of mass that is not within Pluto itself. In that sense, they can sometimes be considered a double planet system. The Witches’ Stones Book 2: Love and Intrigue under the Seven Moons of Kordea. It is the innermost of Pluto’s five moons, and by far the largest, at about 600 km in radius. That compares to Pluto’s radius of 1185 km, so its radius is about half that of its companion planet. Its mass is about 11.6% that of Pluto. By comparison, Earth’s moon is 1737 km in radius, relative to Earth’s radius of 6371 km. Our moon has 1.2% the mass of Earth. Pluto’s other four satellites are very small (50 km or less and irregularly shaped). Only recently have we seen them as anything other than points of light. As noted above, the common center of mass, about which the two bodies, Charon and Pluto, revolve lies outside of Pluto. So, they do a sort of orbital dance around this point. This is clearly seen in the recent data from the New Horizons spacecraft. By some reckoning, that makes it a minor planet in its own right. Both bodies are tidally locked to each other – i.e. they always show the same face to each other. Charon is surprisingly lightly cratered, as is Pluto. This was an unexpected observation, from New Horizons, just last week. It was expected that both bodies would be heavily cratered, indicating a very ancient surface. But, in fact, the surfaces are quite young, rather like the Earth’s surface. On the Earth, this is caused by plate tectonics. We don’t yet know what is the cause on Charon and Pluto. Perhaps their intricate orbital dance creates stresses or squeezing, that provides the energy for the apparent active geology on both planets. There are other surface features, such as cliffs, troughs and canyons of considerable size, indicating some fracturing of the surface. The polar region is dark (it has been informally dubbed Mordor); we don’t yet know why, though it may indicate transference of some matter from Pluto to Charon. Generally speaking, though, Charon is darker than Pluto. It appears that Charon’s surface is dominated by water ice. There have been speculations of liquid oceans beneath the surface of Charon and/or Pluto. It’s density is quite low, indicating that water ice probably makes up a substantial part of its mass. There appear to active cryogeysers and cryovolcanos (cryo=cold). Speaking of cold, the average temperature on Charon is probably a frosty -220 degrees Celsius (about 50 degrees above absolute zero). In mythology, Charon was the ferryman to the underworld, so it’s a good name for Pluto’s main satellite (Pluto was the god of the underworld to the Romans). It is thought that the Pluto-Charon system was formed from a collision at some point, but nothing very definitive is known yet. Here's a nice shot of Charon, taken by the New Horizons spacecraft in July 2015, during the fly-by. Helena Puumala's SF Romance series features the planet Kordea, home to a race of beautiful and powerful psychic aliens, known as the Witches of Kordea. The planet has seven moons, an extraordinary arrangement for a terrestrial sized planet in its star's habitable zone, as is noted in Book 1, which you can get from the link below: :). 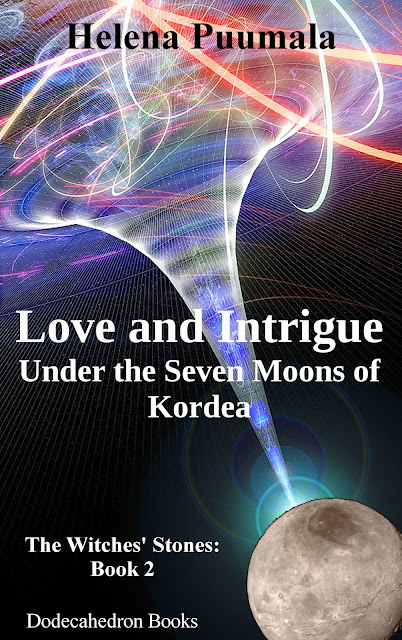 In fact, the moons of Kordea become a central element in Book 2, now out as well. The cover below actually borrows Pluto’s moon Charon. I have been testing out different moons for the cover of the Witches' Stones Book 2, so, as noted above, this gives me the opportunity to do a mini-tour of some of the major moons of our solar system. Moons, including our own, are fascinating. A terrestrial planet with seven moons would be cool (though it would probably be a very unstable arrangement). Hello Pluto! Thanks for the Valentine.